Julia began to hum cheerfully while she hammered another nail into the wall. Already, he could hear the sounds of her nail scraping against a bolt. That’s it. I can’t stand it anymore. He pulled the hammer out of her hand, and tossed it aside. He leaned down and covered her lips with his own. If he said something back, they would have gotten into a long discussion about why this was a bad idea. But it wasn’t a bad idea, it was a great one. They had talked in enough circles this weekend. It was time for action. He wrapped his arms around the small of her back and pulled her close, kissing her long and hard, expressing what he wanted, and begging her to accept. In response, she pressed closer, and moaned deeply against his lips. And that was it. With that one little moan, he was completely lost. I have been waiting for this book to come out! I've enjoyed all your books, but for some reason this storyline really peaked my interested. Maybe its because my knight in shining armor showed up at a college party. Keep writing! Thank you for your comments! 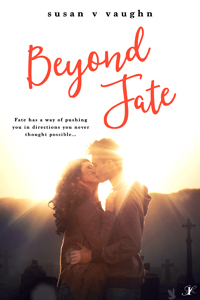 I have a huge connection to Beyond Fate because I wrote the first chapter of it when I was still in college. It was my freshman year. I attended Central Michigan University, which is the same college my characters meet. The fraternity party they were at is based off a frat house I used to go to all the time. Years later, when I found this story, I decided it needed a proper ending. I began the story from a college perspective, which is when my characters first fall in love. I finished the story from an adult perspective, which is when my characters get their second chance at love. What a creative idea! Thanks for sharing the story behind the story. And, Fire Up, Chips! Hey Sue. Thanks for another amazing read! I just enjoy your characters so much. They are real and funny and touch my heart. Its so rare to find a story that makes me feel right along with the characters. And that touch of mystery, of the unknown, it makes me want to believe. Thanks for giving me a wonderful escape! I wanted to share with you guys another reason why this book is so special to me. I wrote this for promotional purposes for Beyond Fate, and never got around to utilizing it. But I think it brings to light a subject we are all familiar with. There is no scientific proof of communication after death, and yet a lot of people have claimed to have felt, or experienced something that proved their loved one was near. I never believed those people’s claims had any validity until I lost my grandmother five years ago. My grandmother was an amazing woman, who adored bird watching. I have so many childhood memories sitting with my grandmother on her porch swing watching the birds that landed nearby. She could name them all—the Blue jay, the Robin, the Piping plover. But her favorite bird was the Cardinal. When that little red bird landed nearby, you would know by her shrieks of excitement. Losing my grandmother was painful, even though it was her time. She was old and lived a wonderfully full life. Still, I remember driving home after her funeral, crying because I missed her. And that’s when I saw the Cardinal perched right on top my mailbox. We get birds of all kinds around us, and logically a bird could land on my mailbox at any time. But in my heart, I knew it was a message from my grandmother. She was still around and still watching over me. Since that first sighting, I have seen the Cardinal many times. My children are the ones who shriek with excitement now, "Mom! It's grandma bird! She's right outside our window." Both the main characters in my novel, Beyond Fate, suffer the loss of a loved one. For Russell, the loss is his sister. For Julia, the loss is her best friend. Although Katherine Webb is dead, both Russell and Julia began experiencing signs from her. But it’s only when they start following those signs that they find their paths intertwined again. It's almost as if Kat is playing matchmaker from beyond, which is consequently how the story got its name. Signs from loved ones are important, even if they don't make sense. They help us connect to the people we've lost, and they can help us heal. These signs are not about logic. They aren’t something you can explain. And they shouldn’t be explained. Anyone who has experienced loss in their lives knows this is true. Sometimes in life, it is better to close your eyes to what makes sense and open your heart to what could be. Thank you for your comments, Marion! And for your support.